ComScore’s annual Mobile Future in Focus report also shows that Apple is the top-selling manufacturer of smartphones in the U.S., with 29.6 percent of the smartphone market. Although three different iPhone models account for the most popular individual smartphones sold in 2011, iPhones only make up roughly 30 percent of the total smartphone market. With more than just one hardware manufacturer building phones for the platform, Android reigns as the leading smartphone platform at 47.3 percent of the market. Still, comScore data suggests that RIM BlackBerry users are more likely to switch from a RIM device to an Android device, rather than an iPhone. When looking at mobile traffic across all portable devices, Apple is the clear winner in the U.S. at 60.1 percent, thanks to the iPad, iPhone, and iPod touch models. 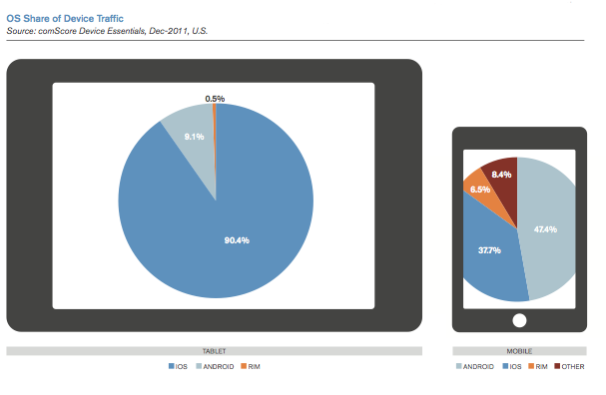 A breakdown of iOS traffic shows that 90.4 percent of all tablet traffic came from the iPad in December 2011, where 37.7 percent of smartphone traffic came from the iPhone. As for app use, the most popular mobile apps amongst iPhone users are YouTube, Google Maps, and Facebook. Overall smartphone adoption in the U.S. has grown from 27 percent in 2010 to 41.8 percent in 2011, thanks in part to a wide variety of phone models at different price points across multiple carriers. For a full report, visit comScore’s Mobile Future in Focus press release.